When I started airsoft I was just happy to hit a tin can off my back porch while standing still during my targeting sessions, but after my first couple of matches, it became very clear to me that the stock scope on my rifle just wasn’t going to cut it. Not only could I not get those little bb’s to hit my opponents regularly, but I lacked confidence in my sights which really took from the whole experience. That’s when I started my search for quality airsoft scopes. 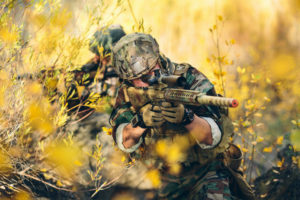 Airsoft is a fun game when played right, but it’s a whole lot more fun for the folks that know how to aim consistently than it is for the guys that plink away missing their targets 90 percent of the time. I started taking a look at the different scopes out there today, some were meant specifically for airsoft rifles, and others were designed for other guns but worked quite well. I put together my research and experiences into a compact guide to help with identifying the very best airsoft scopes. So if you’re sick and tired of getting destroyed by your sharpshooter opponents that land shot after shot while you struggle to get bullets to travel the right way, you should at least consider picking up a higher quality scope to improve your results, trust me it helps!